The North Face of Mt. 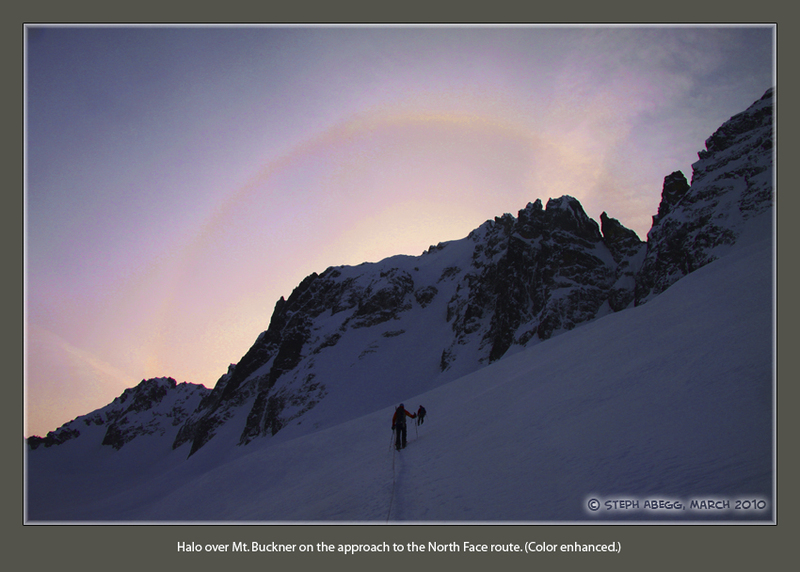 Buckner is not often climbed or skied in the winter or early spring, but if the weather and conditions are right (as they were for us), it makes for a wonderful adventure complete with wallowing, exciting climbing and skiing, thinly bridged crevasses, great views, downclimbing steep ice, basecamp on one of the largest and most beautiful glacier in the Cascades, frigid belays, and lots and lots more fun and memories. 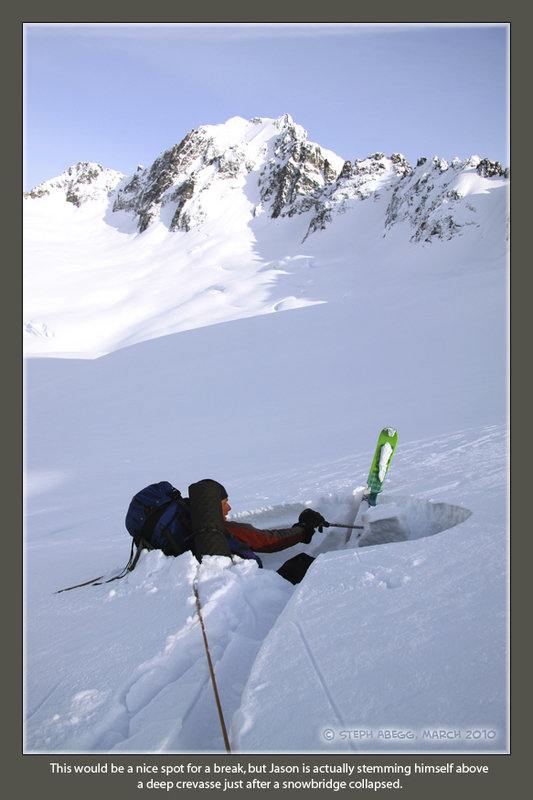 * The SW summit is listed as 9114 ft, which makes it the higher summit relative to the 9112 ft NE summit. 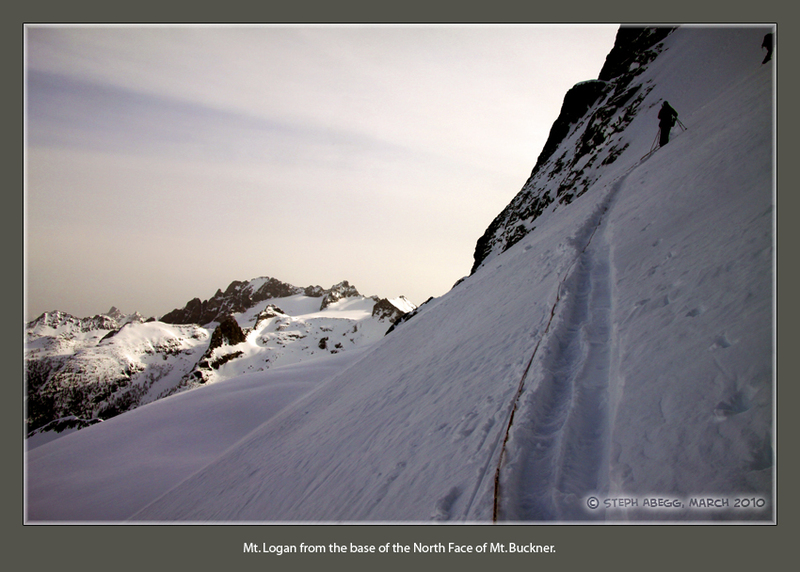 However, at some angles - such as from the SW summit - the NE summit actually appears higher. 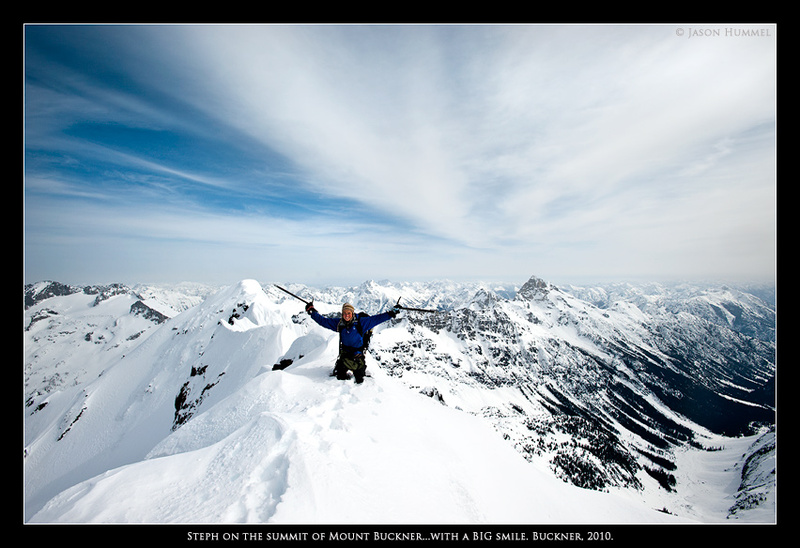 This has been a topic of debate among county high point peakbaggers, since Buckner is the Skagit WA county high point with over 3000' prominence. 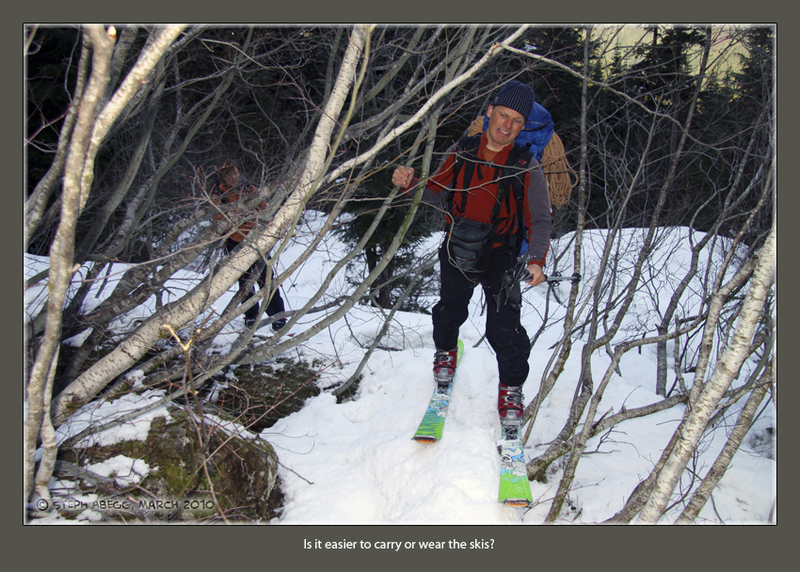 This debate inspired the creation of a program that employs photo pixel analysis to determine elevations. 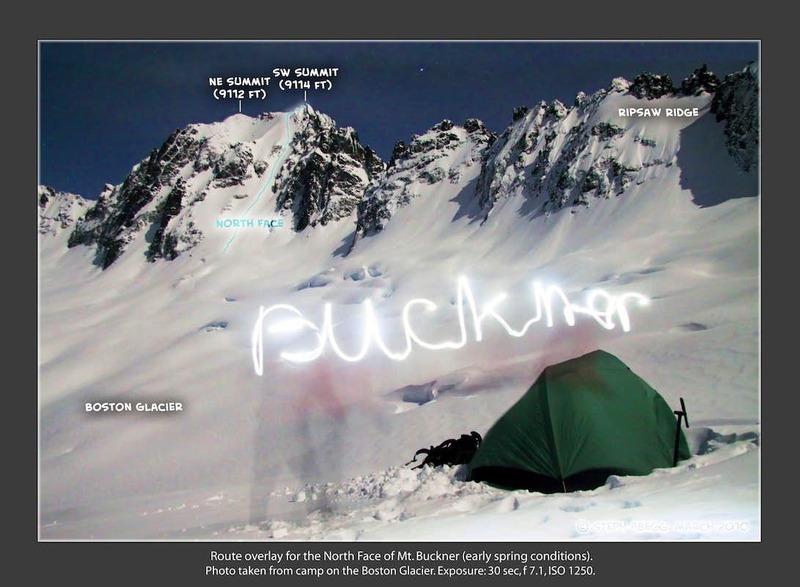 This program was used to determine that the SW summit of Buckner is indeed 9.6 inches higher than the NE summit (hence, probably closer to 9113 ft than 9114 ft). This is all very fascinating. 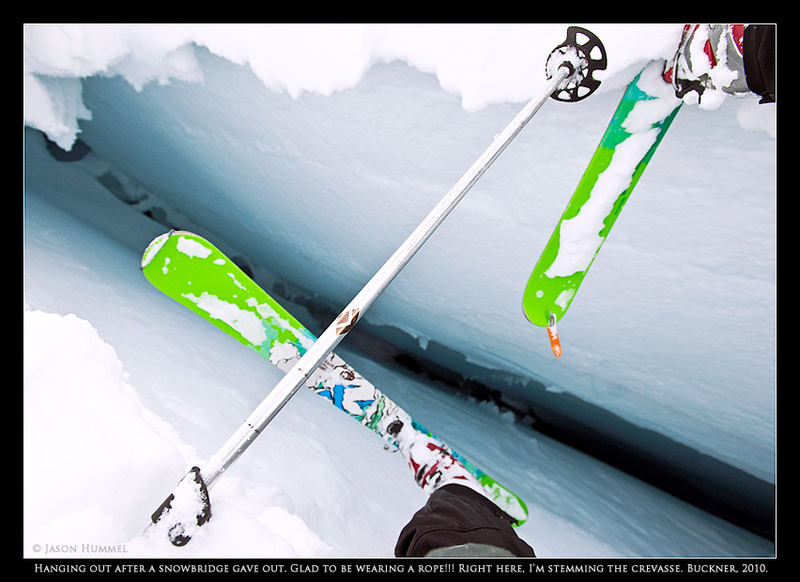 It would be interesting to do a photo pixel analysis to determine if the SW summit is still the higher one under winter snowcover! The trip took us 2 days. 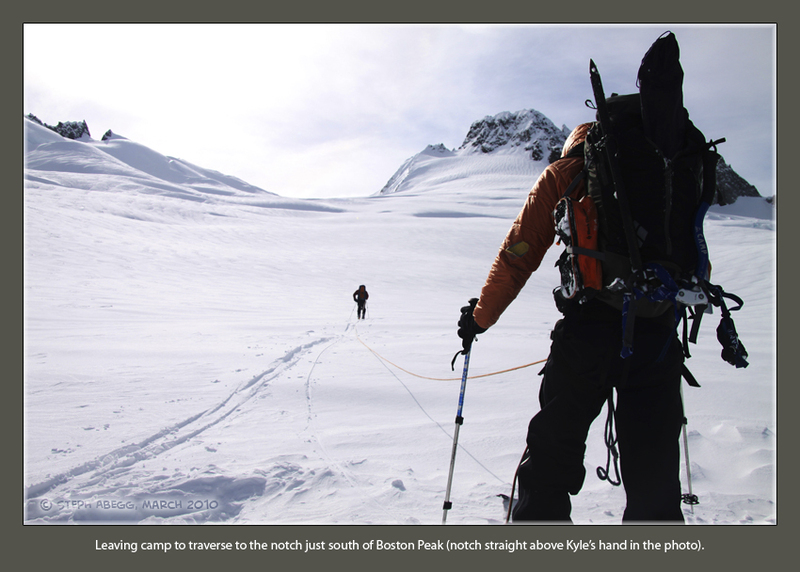 Day 1 involved skinning/snowshoeing into Boston Basin, and getting to Boston Glacier via the Sharkfin Col (which involved a single-rope rappel to get below the bergschrund on the other side). 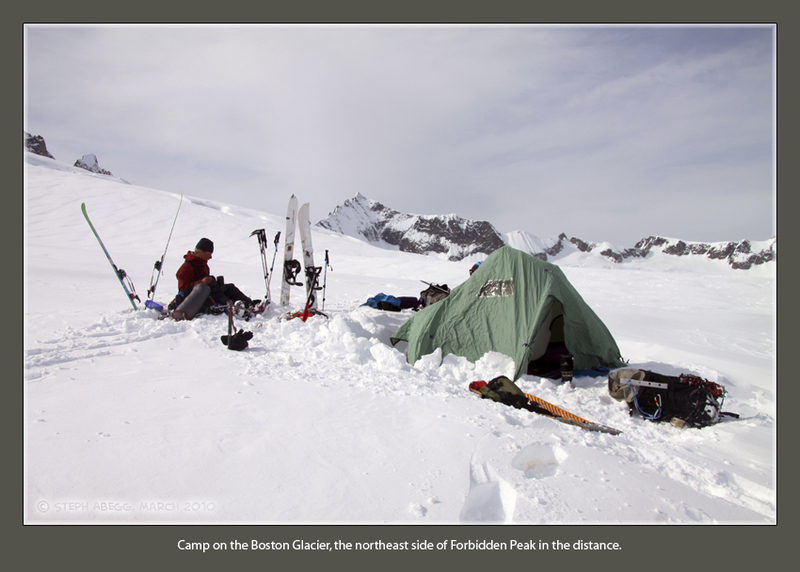 We set up basecamp on the Boston Glacier with a great view of the North Face of Mt. Buckner. Day 2 involved climbing the North Face of Mt. 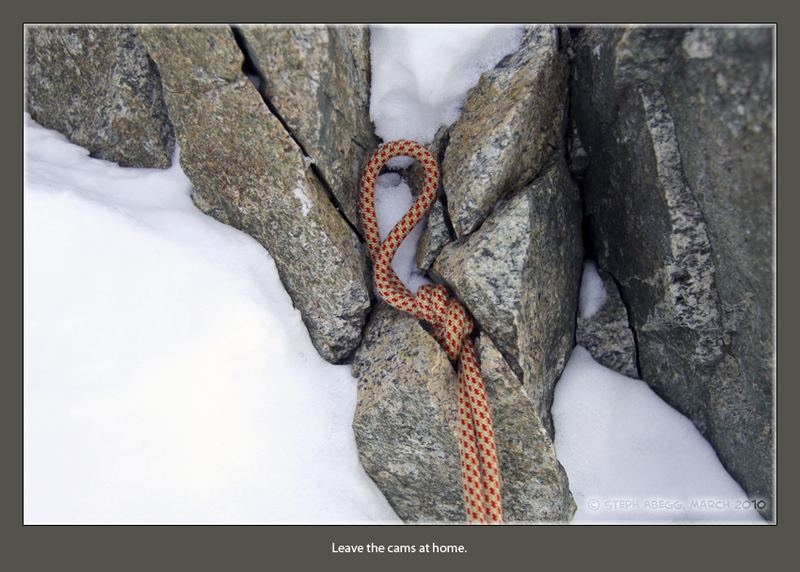 Buckner and then packing up camp and skiing/snowshoeing back to the car. 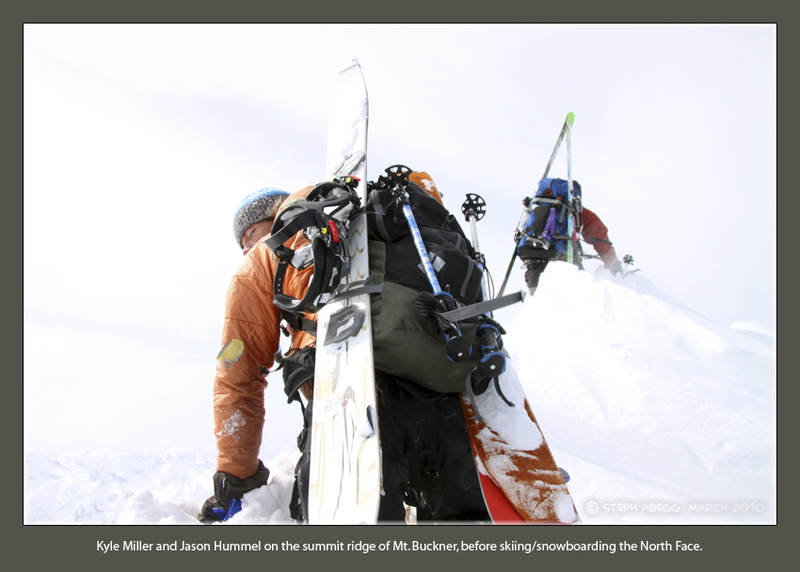 Jason and Kyle skied/snowboarded the North Face while I backed down. 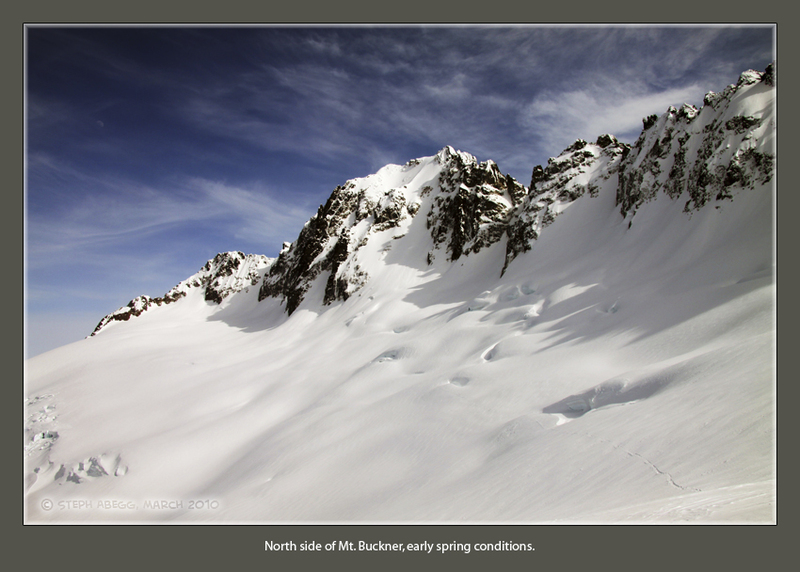 On the way out, we chose to use the notch just south of Boston Peak (between Boston and Boston-Sahale col) to get back into Boston Basin. 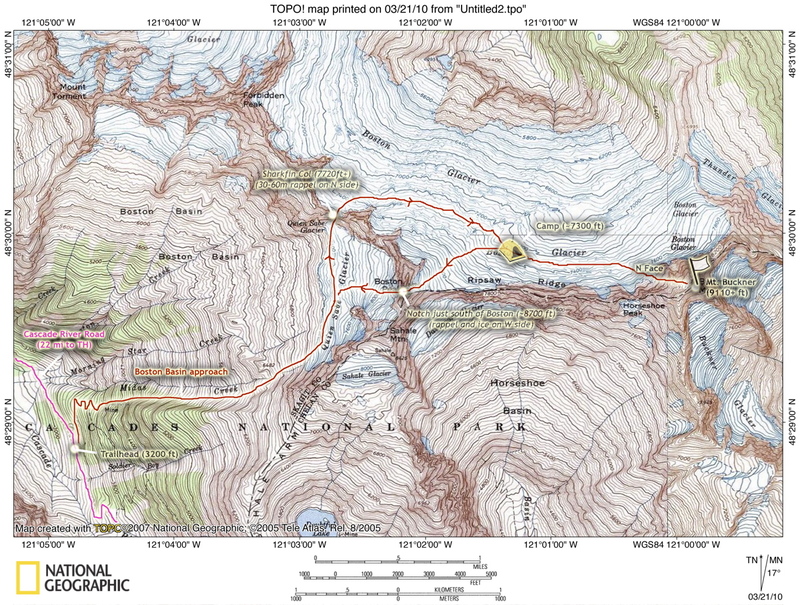 Topo map of the route we took. 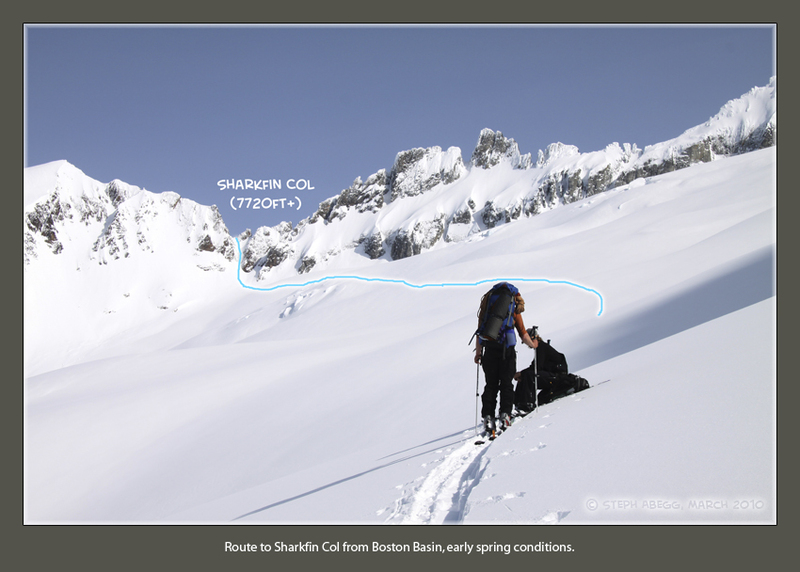 Route overlay for the North Face of Buckner, early spring conditions. 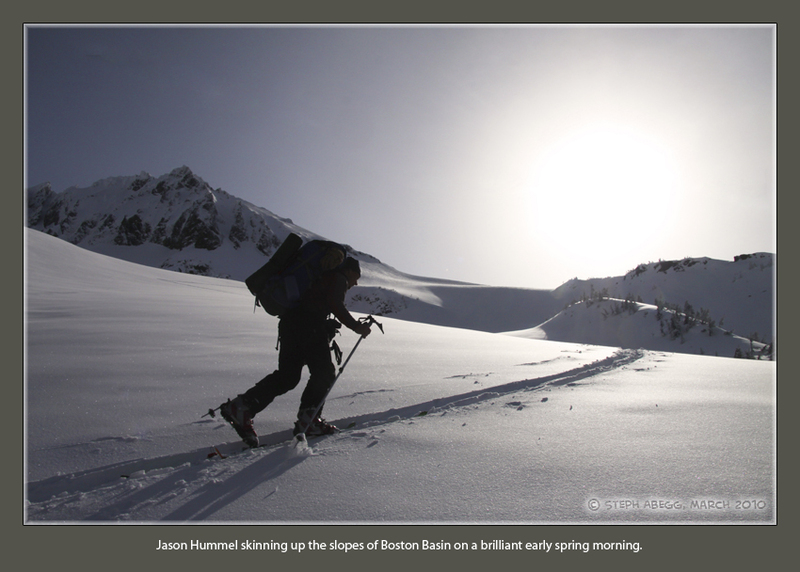 The approach involved skiing/snowshoeing through Boston Basin, going over the Sharkfin Col, and setting up basecamp on Boston Glacier. 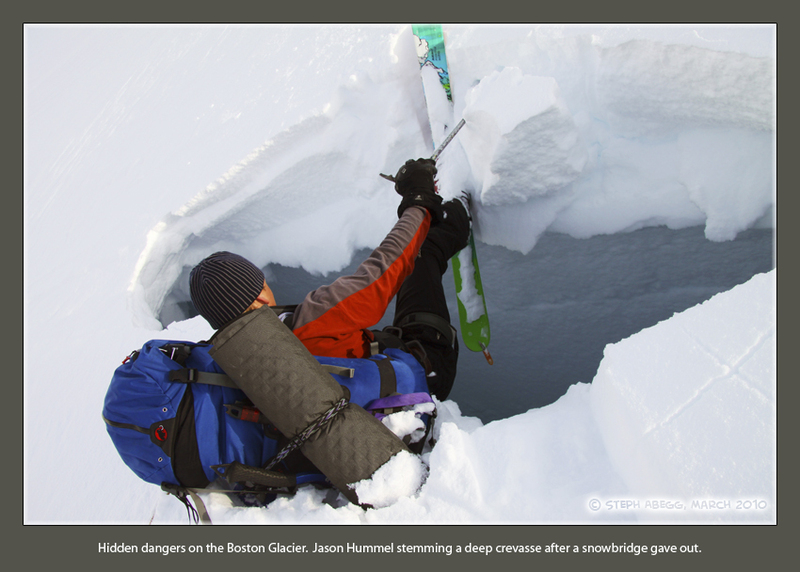 While crossing the Boston Glacier, Jason punched through a snowbridge and nearly fell into a deep crevasse, but reacted quickly to get his ski stemmed on the opposite lip of the crevasse. We climbed the North Face of Mt. Buckner on Day 2. 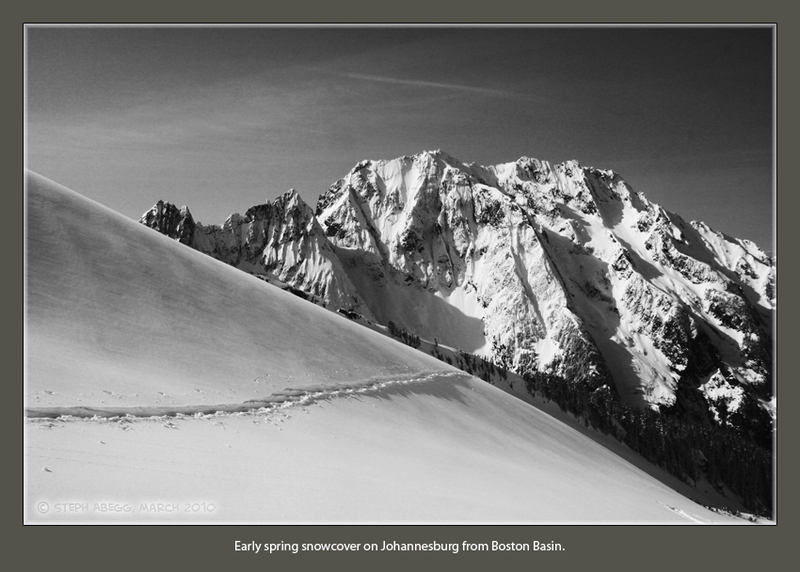 In early spring conditions, the route involves about 1300ft of 40-50° snow. 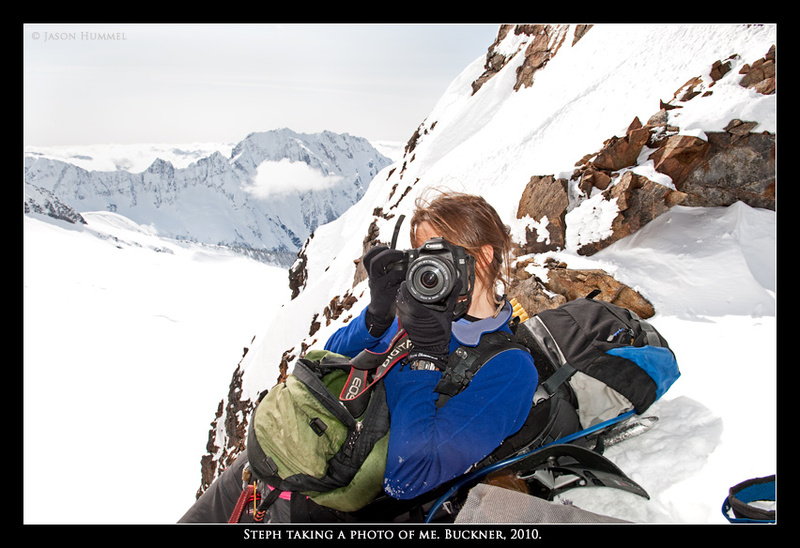 The conditions were great on the way up and the summit views were spectacular. A wind picked up just when we reached the summit, so we did not linger long as we wanted to get down before there was too much wind-loading on the face. 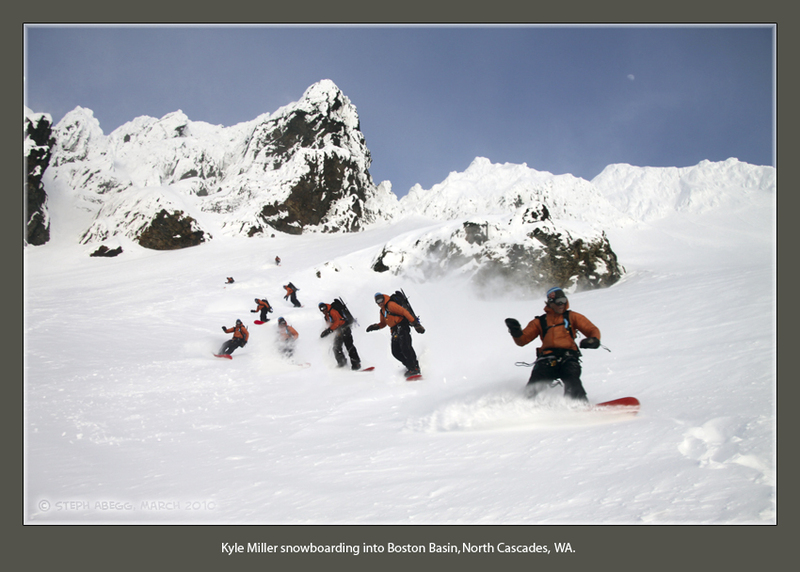 Jason and Kyle skied/snowboarded down the North Face in a few minutes, while I backed down in about an hour. It was a fun climb. 360° pano from the SW summit of Buckner. 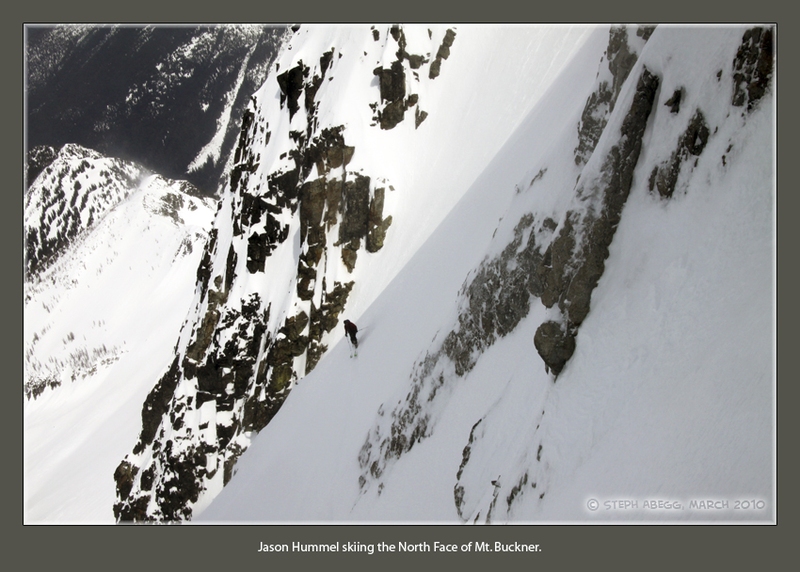 Jason is sitting on the SW summit, and the NE summit is on the left side of the panorama. It was a hazy day, but you can see (from left to right) Logan, NE summit of Buckner, Goode, Booker, the peaks of the Ptarmigan Traverse, and the SW summit of Buckner, among others. 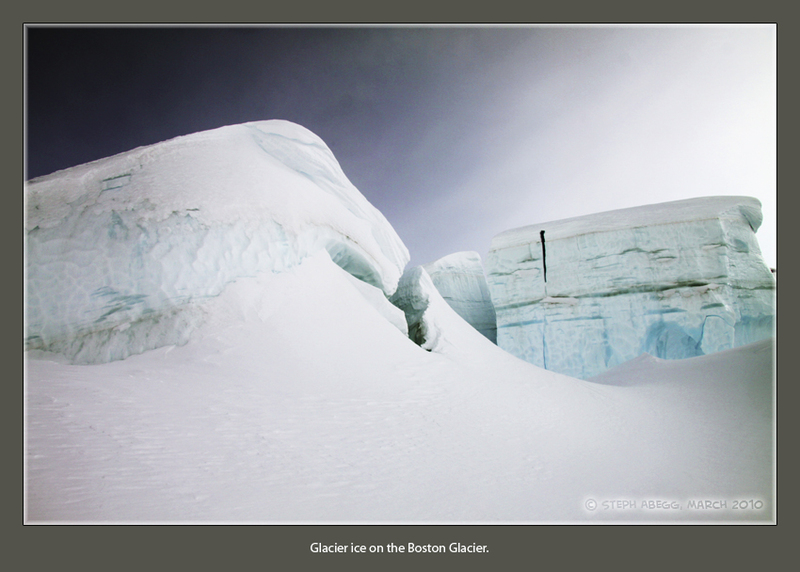 Click here to go to my panoramas page to see more panoramas, many of them labeled! 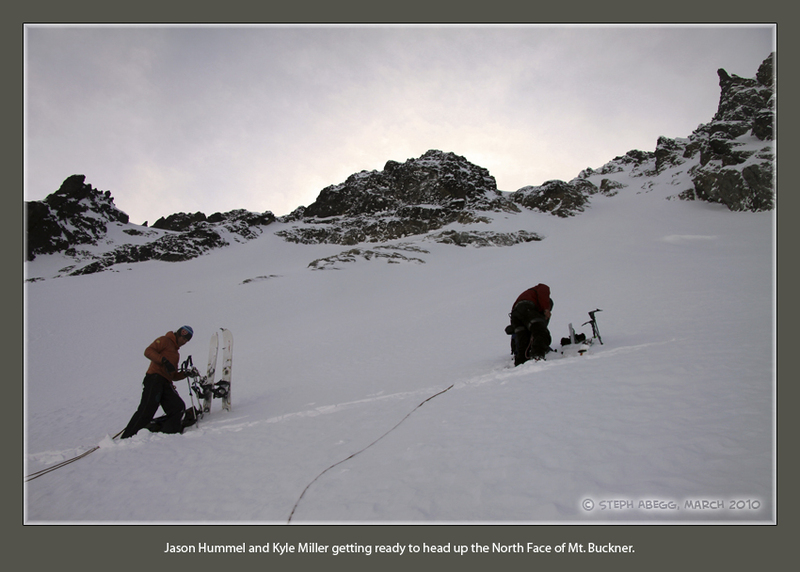 After climbing/skiing the North Face of Buckner, we packed up camp and headed out. 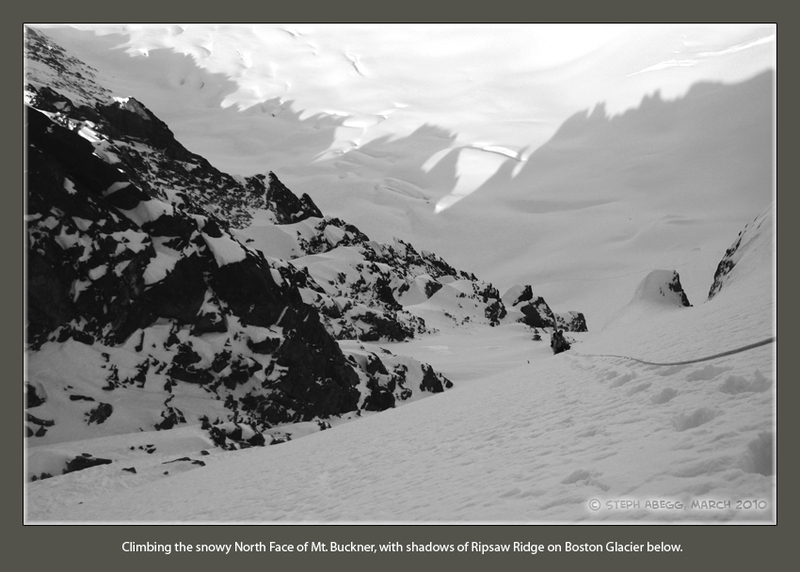 We chose to get back to Boston Basin via the notch just south of Boston Peak (between Boston and Boston-Sahale col). 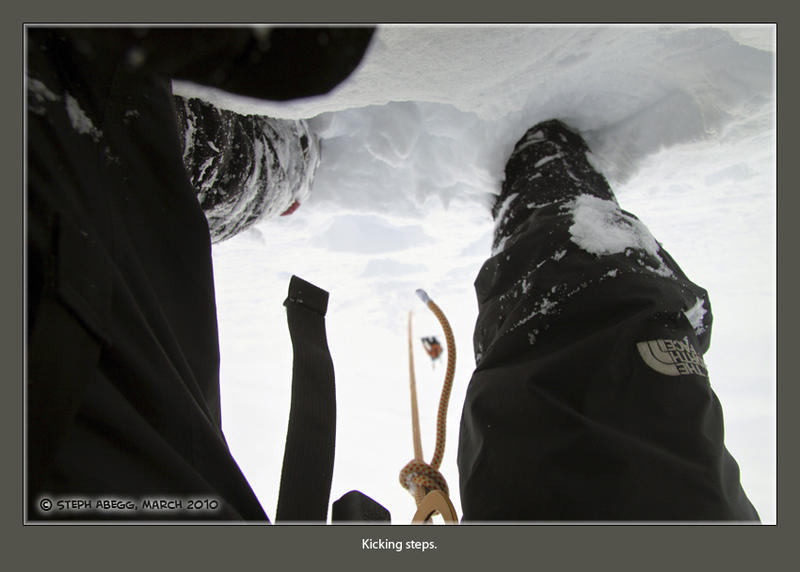 It was fun to try a different way out, but in the end it probably took longer because of its high elevation and some icy conditions in the rappel/descent gully on the other side. We got back to the car shortly after dark. What a fun trip! 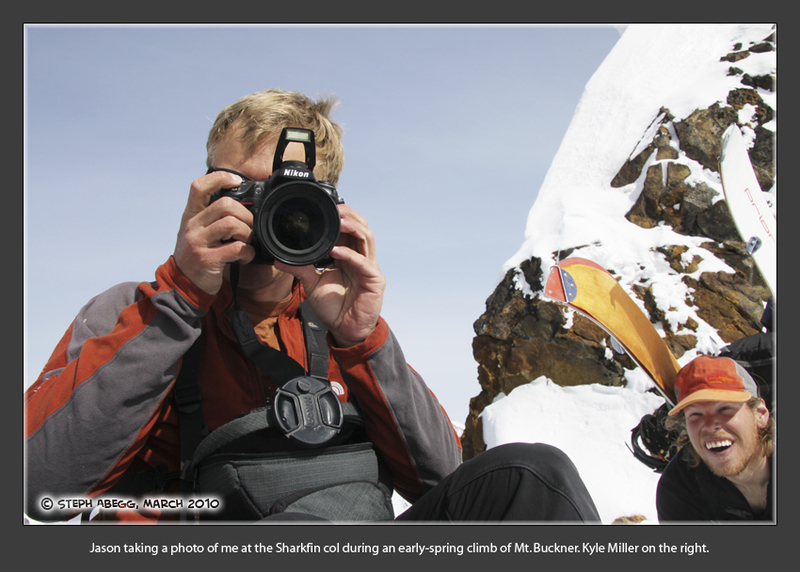 To see the adventure through Jason Hummel's lens, here is the link to Jason's TR: http://cascadecrusades.org/SkiMountaineering/buckner/nface2010/nface2010.htm.